Papadiamantis studied literature but he is a theologian, because a theologian is not a person who has a degree in theology, but the one who truly prays, according to blessed Nilus the Ascetic. A theologian is essentially a faithful person who lives an authentic Christian life, a friend of God, a partaker of God, a saint, the redeemed and saved. Inside our Orthodoxy nobody is ever saved individually; he is saved when he shares his life with other people, helping them to be saved in various ways. Papadiamantis’ God is the Creator of the universe, the Creator of man, the Almighty, Divine Providence, the caring Father. He believes in God’s will, in Divine Providence, in Divine Grace, in Divine reward and just judgment. Papadiamantis firmly believes that it is not easy for the modern Greeks not to believe. Inside the Church, the innate religious feeling and sentiment is strengthened. The Greek has to strive too hard if he is not to have any faith at all. However, Papadiamantis justifies the alienation of the people as it is a result of the breakdown of the bond of love with the Greek Orthodox tradition, a fact that deteriorated because of the loss of trust caused by scandals that broke out in the clergy. For Papadiamantis, tradition is, as he says, “to live according to God’s law”. He, eventually, admits: “I am a genuine child of the Christian Orthodox Church, as it is represented by its bishops”. In another case, however, he is not hindered from criticizing them strictly for their various provocative actions. He writes that the Greeks follow “Christian worship without faith and an honest conscience”. The lack of morals, the deterioration of morals, the immorality, the hate for our neighbors had begun to prevail all over our land. What would the wonderful Papadiamantis say today, a hundred years later? The solution to the problem, according to Papadiamantis, is to repent and to return to the fair and genuine ecclesiastical tradition. More specifically, he stresses: “Proper defense of our home country would be the conscientious functioning of the institutions, national education, honest administration, the eradication of foreign materialism and of the mimicking which have corrupted the spirit and have degenerated the nation, and the prevention of bankruptcy”. His words, my dear brothers, as you very well understand, have significant validity even today. Papadiamantis thinks that the problem is aggravated by the unwillingness of church leaders to take action. He does not want the Church to do business or to stage plays. There is only one solution according to him: the conscientious return to the saint-sustaining experience of the Church and its life. Inside the holy and saving Church which explains the right faith, the human being is born again, is transformed, and is armed with the armor of light and of grace against sins of every kind, and meets once again the living God of mercy and compassion. The great choice depends upon the human being. In Papadiamantis’ rich work his suffering figures usually reach redemption through sincere repentance and then they live a new life. Not always, however. Some of them remain in the dark because they make a bad use of their freedom. Our important prose writer from Skiathos often describes nature “with love”, but he is not a conceited ecologist, or a nature-worshipping dreamer. By referring to the beauty of nature and describing it elaborately, he proceeds towards its Creator and glorifies Him for His perfect wisdom. He has written about these kind of people in one of his short stories: “Little, involuntary pagans who after so many centuries still keep worshipping nature unconsciously.” He is certainly grieved when the beauty of the natural environment is destroyed, and writes with a sorrowful heart: “The infamous spirit has invaded the works of God”. By studying Papadiamantis’ work as a whole, we note that not only did he know to write, to describe, to give an account of the morals of the time, to criticize and to offer solutions, but he, himself, was also endowed with integrity, had chosen to lead a life of piety, of virtue and of honest work and virtuous chatter, a life with a course, a target, a discourse and value. Early on in his life, he had realized the vanity of the mundane and he was not afraid of death, for his faith was warm. He chose to live a simple, spartan, secluded life, quietly, peacefully and calmly. He did not become conceited; he chose to stand by the humble and the despised and he introduced them marvelously into his work. Papadiamantis’ work preserves the pure piety of the people. The priests in his work are simple, poor, and even naive at times, but they feel with all their existence the mystery of the living God, the genuine Orthodox Christian way of living and liturgical tradition, even when they cannot express it. Being fully aware of their sinful nature, they never cease praying for mercy, life, peace and salvation for their flock, whom Christ Himself entrusted to them. They do not attempt “liturgical renewals”, for they are satisfied with the food offered by the existing genuine tradition, glorifying the Most High continuously and invoking His ineffable mercy. Papadiamantis declared his faith strongly and undeniably in his characteristic way: “For as long as I live and breathe and have my logic, I will never cease singing hymns of worship to my Christ”. Sin pains him, the babylonianism of Athens grieves him, the gossip of his island about the ones led astray by sin tires him; however, he does not give up struggling, hoping, trusting God, presenting some of his heroes as saints: the childless Seraino of “Karahmeti’s Wedding”, the simple shepherd in “Poor Saint”, the glorious new martyr in “The Widow of the New Martyr” and others. We must not forget that Papadiamantis is the son of a devout priest, who is a follower of the genuine renewal Athonite movement of the revered Kollyvades. He is brought up with divine liturgies, sacred books, holy icons, inviolable Church traditions, with the nice customs and the excellent morals. He studied the fragrant biographies of the saints, the patristic and neptic texts, the amazing "Philokalia", the songs of the services. He was a reader and a chanter of the Church. All this knowledge made him go to Mount Athos in order to become a monk. However, after staying for less than a year at the Hermitage of the Annunciation of the Monastery of Xenophontos, he returned to the world, always feeling deep respect towards monastic life, especially the Athonite. His ecclesiastical ethos make him feel no anger or fanaticism against the sinful heroes of his works, and all his fellow human beings in general. He hopes in repentance, he believes in God’s love, he considers that offering alms is preferable to justice. He loves focusing on repentance, not as a professional preacher but as a compassionate brother. Sympathy towards weak fellow human beings characterizes the real Christian, the evangelical man. So Papadiamantis grew up with Byzantine psalmodies, pure candles and Athonite incense. Throughout his life, he remained attached to the Church. He believed in God strongly, he believed in the intercession of the saints and of the Holy Virgin, he believed in their miracles. His good cousin, Alexandros Moraitidis, tells us that when once Papadiamantis became well after a strong toothache, he wrote a whole service for Saint Antipas who is the patron of all those who suffer a toothache, to thank him. Papadiamantis was not a dreamer of the past, but an admirer of the truth which upheld generations upon generations, so that they created marvelous cultural works and an inspired upright way of living. Papadiamantis is evidently not a saint with a saint’s halo. But he is a fighter. He is not unsocial, miserable, isolated, inhibited, disadvantaged and torn. He is a voluntary monk in the world, without property, gracious, poor, simple, spartan, single, modest, humble. He is not a lover of the flesh but a naturally tempted man. He loved wine but he was not a drunkard. Once, a monk went to a spiritual father at one of the Holy Mountain’s hermitages to confess his sins. He found the father drunk and dizzy. He was scandalized and told him that he had come in vain to confess his sins to a father who is a drunkard. Then, to his astonishment, the spiritual father said: “Yes, you have come three times to confess but you did not confess that sin!” Let us not be too critical or condemn everyone in haste. It would be better if we were strict with ourselves and lenient with others. Papadiamantis should be for the Greeks what the great Dostoyevsky is for the Slavs. He is a prophet of our race. He writes “Μη θρησκευτικά, προς Θεού!" ("No religion, God forbid!"). "The Greek nation is not Byzantine, do you understand? Today’s Greeks are directly descended from the ancients. Then they became civilized and made progress. They kept pace with other nations… An Englishman, or a German, or a Frenchman can be cosmopolitan, or anarchist, or godless, or whatever. He has fulfilled his patriotic duty; he has built a great homeland. He is now free to profess, thanks to his luxuries, his lack of faith and his pessimism. But a Graeculus of today who wants to publicly display the fact that he is godless or cosmopolitan looks likes a dwarf who is trying to stand on his toes and is stretching his body to gain height, to look like a giant himself as well.” This is why he says “most of the stories written by me… are rather religious”. The inspired Papadiamantis knows what he is doing. With his work he is honored as a pedagogue of Orthodox Christian Hellenism. Once, feeling pain and holy indignation, he wrote while he was in Athens: “Here Mammon is truly deified; it would be a thousand times more preferable if the ancient poetic idolatry existed instead. Nevertheless, now the dominant religion is the filthiest and the most brutal Materialism. Christianity is only as a pretext a religion.” What would he say today? He hated riches and loved poverty. From what few things he had, he gave alms in secret. He wrote what he himself had lived: “One must remain in the position where he was at the beginning, however humble, however poor it seems to be; the honest worthlessness is forever a lot more preferable to hollow and flamboyant luxury and to enjoyable life.” He lived and died poor, modest and humble. He passed away in his beautiful island a hundred years and a month ago at the dawn of 01/03/1911, after he received Holy Communion, chanting and weeping. Today, most of our literary figures, our intelligentsia, our journalists delight in doing a lot of things which they should not be doing; several deride and vilify Papadiamantis. He spoils their schemes. Graeculism, godlessness, nihilism, corruption, love of money, love of flesh and ambition prevail and they do not want to be disturbed by powerful and pure voices such as Papadiamantis’, whose life and work judges them. Sleep sir, Alexander, in the arms of your island quietly. You fulfilled your duty both as an Orthodox Christian and as a Greek. Your life and your work light the darkness. Darkened, trapped, betrayed, allured by foreign sirens, Greece which you loved so much, is ailing. Imprisoned in the bitter deadlocks of individualism, materialism and godlessness, it mopes and pines. May the pages of your works and the example of your life become windows of freedom for the return to a graciously simple living that will be genuinely humble, truly repented, truly Christian. 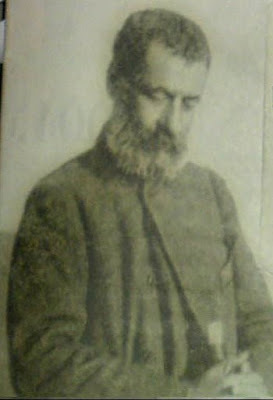 Alexandros Papadiamantis had always been attached to the Church. He was never tired or burdened of this relationship. He was a true Christian. He was a faithful servant of the Lord. He was the one who heard from St Anastasia: “Go away, incurable one; pain will be your life…” Only a genuine Christian after hearing this could write: “I felt a wild joy because the Saint had not listened to my prayer.” Papadiamantis is not merely a romantic nostalgic person of a bygone nice picturesqueness which no longer exists, but he was nostalgic of a substantial, true and well-timed Christian living which is worth living to its utmost, my dear brothers. Thank you very much for coming and for your attention. Acknowledgement: We are grateful to Geronda Moses for giving us his permission and his blessing to publish the translation of his talk.